I need to decide whether or not to sell the device without using it, otherwise the price will fall down - and I'm the first among my friends to have one of these, which means I can't just borrow one and test it. I've read multiple reviews, but everyone's just praising the device and the criticism is mostly expressed as "this brake is made to help beginners, and its functions should make the life of someone who just started to climb much easier". The thing is that an anti-panic handle, lead and top rope modes and stainless steel reinforcements mean pretty much nothing to me. What would really make me choose to keep this device are advantages 3 and 5: if it's really much easier to pay slack with this thing, and if it wears the rope less, then I'll keep it. All disadvantages are really important to me, specially 3 and 4. Check the picture below. Notice how the back of Grigri2's casing (right) was smartly substituted by a new chamber design on the Grigri+ (left)... But notice also how the area to place your finger has disappeared in the Grigri+ (you can't see it in this picture, but the small orange button to place your finger is flat and not very anatomical). So: have you used this device? Does it wear the rope less than its predecessor? Is it really easier to pay slack with? Have you had any problems with the belay/top rope button? Does it wear the rope less than its predecessor? I don't know, I didn't use it more than a few times, and my ropes get used with all kinds of belay devices. So I can't comment on the rope wear. Is it really easier to pay slack with? Paying out slack works well, a slight bit better than with the older gri-gri. But the ropes I used it with are within the recommended diameter for both devices (9.4-10.3mm), while the Grigri+ is recommended for a wider range (8.5-11mm). In that range, the difference could be larger. Have you had any problems with the belay/top rope button? The switch itself works fine. You'll quickly get used to the smaller area for grabbing the device when paying out slack. In my experience (and personal opinion), the anti-panic function is overrated. After five years of climbing, I never felt that an intuitive panic reaction would be to pull on the handle instead of simply holding on to the brake strand of the rope. The panic function locks the rope if you pull on the handle too hard, but can be "overridden" by pulling even harder. 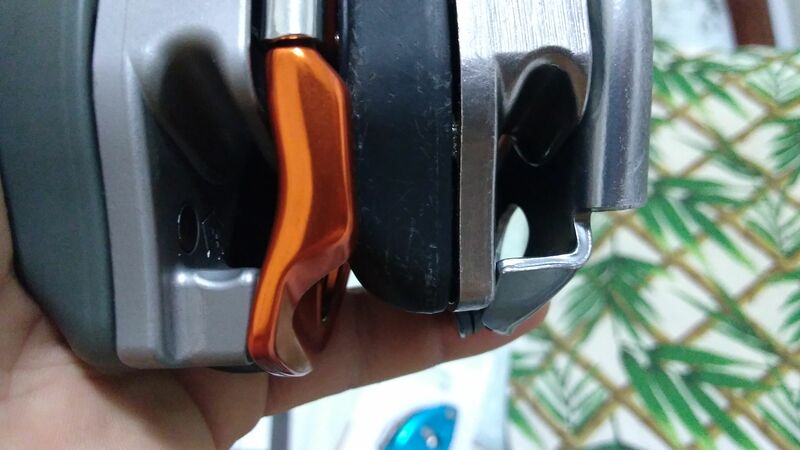 The general gist of reviews of the Grigri+ seems to be: If you currently own an older Grigri, there rarely is a need to switch to the new one. If you are looking to buy a Grigri, the Grigri+ might be worth the additional cost if you either climb with beginners or need the additional range of supported rope diameters. I prefer devices like the Mammut Smart or AustriAlpin Fish for leading, so I'm not that used to belaying with a Grigri. Thus, I cannot comment on the fine details, but both devices generally "feel" very similar when paying out slack. Things might be different if you are an experienced grigri lead belayer. Supervision of children/beginners learning how to top-rope belay in climbing school. Occasional rope climbing with the GRIGRI. I own a Grigri1 and a Grigri+, and I'm used to the Grigri2 too. To me Grigri+ is better. Positives: new materials, improved casing, no sharp edges, anti-panic handle, greater range of ropes can be well controlled by belayers and, last, the new system about belaying top-rope (though useless to me). Negative: the more you go further 9,4 mm the more you experiment difficulty with paying out slack. No problems I find neither with the dimension of the item nor with the absence of the rounded fold on the outer left. I hope my english is good enough. Keep your Grigri+, unless you're in money need. I went from "One" to "Plus", but I wouldn't do it if I owned a Grigri2. Now I'm pretty satisfied. Not the answer you're looking for? Browse other questions tagged rock-climbing belaying gri-gri or ask your own question. Climbing with a much lighter partner? How should I vet belayers? What should I look for? How unsafe is this belay technique really? Can a click-up belay tool cause rope wear?